Stock Picks IT Sector - Game Over? 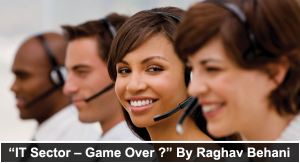 IT Sector - Game Over? Is it game over for the Indian IT sector? The recent developments in Infosys are more related to friction in the top management but they come at a time when the IT industry is probably reeling through its toughest time in recent history. IT companies are out of favour with most investors and fund managers. In this post we will discuss the headwinds that this sector is facing and what opportunities lie in foreseeable future. The numbers show growth coming to a screeching halt. Most IT companies are expected to zero to mid single digit rate of growth. This is majorly because of changes in technology which Indian IT companies failed to adapt to and protectionist policies in developed markets. Do you think that the revenue growth rate will pick up over the next 2–3 years? Can any company post 15% per annum and higher rates of growth in terms of revenue? Employee costs are the biggest expenditure that IT companies incur. With rising employee costs, visa issues and protectionist policies in developed markets, most IT companies are reeling under the pressure of shrinking margins. The margin woes are here to say for atleast couple of more years. Which company do you think can sustain current margins without compromising on growth? Or which company can grow without compromising on margins? Now, you need to ensure that you don’t over pay what you buy. So keep a check on valuations. We are selectively bullish on the IT space and have identified a stock that fits well into our framework. It is our latest recommendation to our clients. We believe that the company will do good in the coming 3 years because it has growth triggers, margin stability and is available at a fair valuation.